In a Dutch oven, heat the olive oil. Brown chicken pieces in batches along with some of the bacon. 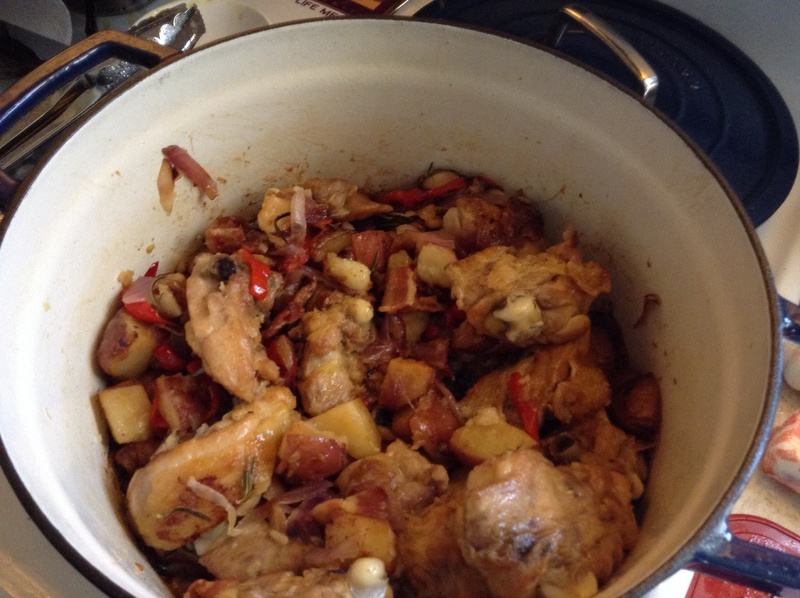 Keep aside in another dish till all the bacon and chicken are browned. Add the potatoes in the dutch oven and let them cook till slightly done. Next add the sliced onions and peppers. Once they wilt a little, add the chicken, bacon,the rosemary. salt and pepper. Let them cook till done.Check to see that the potatoes are cooked and the onions and peppers are brown. You can deglaze the dutch oven, after transferring the contents onto a serving dish. Serve the sauce with the chicken. It came out absolutely great! This entry was posted in Bell pepper, Cherry pepper, Chicken, Entree, olive oil, onions, Rosemary. Bookmark the permalink.